But why is Adrian so uneasy? Why are the refuges from overseas coming in such large droves? Why are they so hungry, and afraid? Why are they so happy to find the Trinity on foreign shores? Because they left the scourge behind. At least, they thought they left it behind. Humanity's plague returns, and when it does, alliances old and new are put to the test, and the world is upended yet again. The Last Resort contains Adrian's Journal entries from December 3rd, 2013, through June 7th, 2014. It also contains the side fictions Steve Goes to the City, The Only Easy Day, The Last Plane out of Kandahar, The Citadel, Terrible Things in Your Name, and Just Me. what a way to really mess with the listeners head. a death that I never wanted, but maybe the result will be a new world order, literally. Ahhhhhhh. Here we go again. Philbrook and Foster are back with the latest installment of A.U.D. -The Last Resort. Book 10 bridges alot of gaps and answers some question readers/listeners may have had through the first 9, all while blowing everything wide open for what's to come. Adrian makes a couple unAdrian like decisions early on that set the tone for the rest of this rollercoaster ride. Familiar faces return in unfamiliar roles and a world problem once thought to be rectified has once again shown its ugly face...and arms....and legs. If you've read the first 9, this one is a must. If you just so wander upon this one.....take the time and start the series, you wont be dissapointed. I don’t want this series to end!!! Chris Philbrook has done an outstanding job with this book, the main characters have become very real to me as I’ve listened to this series. James Foster is an amazing reader and is the perfect voice for Adrian Ring. This book has moved the series into an incredible direction and I cannot wait for the next one. I have been following this series since 2010 and although this is the 10th book in the series, it is as engaging and entertaining as the first one, only by now you have had the chance to get to know and fall in love, or come to hate, all the characters, the writing style of diary entries makes you feel immersed in the story. 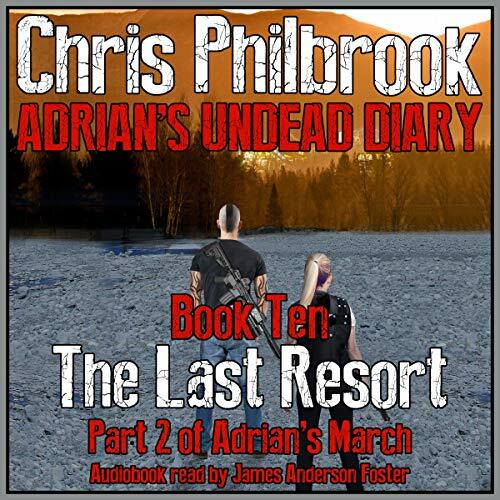 James Anderson Foster is an excellent narrator, no one else could be the voice of Adrian. If you haven't read/listened to the first 9 book, I recommend you go and purchase Dark Recollections and hear thestory from the beginning. Its not just another Zombiepocalipze story. the twists and turns the story takes will have you devouring each and every book one after the other. Also, grab the short story compilations because they add a whole new dimension to the story. Highly recommended. been following this series. love it. leaves you wanting more. cant wait for the next one. This installment into Adrian's world is just as amazing as the rest of the series and even though I'm a bit shell shocked and mad as hell at Chris Philbrook, I will be anxiously awaiting the next book. This was another superb performance by James Anderson Foster! We need the next one ASAP! Yet again wonderful narration and story telling! It is so easy to get caught up in the world of Adrian and his citizenry. This story kept me company on my cross country move and I couldn’t have been more entertained. We just need the next installment! I love this series and was stoked when this popped onto my "preorder" suggestions last month. I binge listened in one sitting and cried several times, can't wait for the next one!